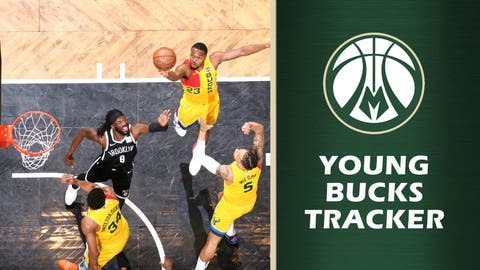 This is the 21st edition of the 2018-19 Young Bucks Tracker. In his second year in the NBA, Sterling Brown has been all about opportunity. As a rookie, it took a while for him to get in the rotation, then as the season came down to the home stretch his minutes became limited. In Year 2, with a new head coach in Mike Budenholzer, Brown really didn’t start getting consistent playing time until December. From Dec. 1-March 24, he averaged a respectable 6.1 points and 3.2 rebounds over 18.8 minutes per game. Brown missed a bunch of games from late February through March 22 due to an injured wrist. When he returned, several of his teammates had injuries of their own and Brown got his first start of the season March 26 (Tony Snell was hurt, and he had been replacing an injured Malcolm Brogdon in the starting lineup). Four games later, Brown has remained a starter. He’s averaging 16.0 points on 51.0% shooting (40.9% from 3) along with 6.3 rebounds, 2.5 assists and 1.3 steals. Against the Clippers on March 28 he had a season-high 15 points then topped that against Atlanta on March 31 with a career-high 27 points to go with nine rebounds, three assists, three steals and a block. In Milwaukee’s last game, a win over Brooklyn, Brown played nearly 36 minutes, a season high, and had 14 points, five rebounds and three assists. Entering Thursday’s game, Brown had played in 54 games with four starts — which mirrors his totals from 2017-18 — and his per 36-minutes numbers are also nearly identical from last year, as well. However, he has increased his scoring and that’s mainly due to a big increase in his shooting percentage. Last season, Brown made just 43.9% of his 2-point attempts and 35.2% of his 3 attempts. He’s raised those numbers this season to 56.0% and 37.2% while averaging roughly the same number of shots (per 36 of 13.2 in 2017-18 and 14.1 in 2018-19). As Brown has showcased this past week, he’s perhaps taking his game to the next level, and could be a key down the stretch and in the playoffs for the Bucks. — This week in Antetokounmpo: Giannis had 34 points against the Clippers, his 29th game this season with 30 or more points. That ties him for sixth-most 30+-point games in a season in franchise history with Kareem Abdul-Jabbar, who had 29 in 1974-75. Abdul-Jabbar also holds down the spots from 1-5 (No. 4 is 32 in 1969-70). — A groin injury kept Khris Middleton out of Milwaukee’s last two contests, but in the one game he did play in he had a season-high 39 points on 16-of-25 shooting vs. the Clippers. It was his most points since tallying 40 at Phoenix on Nov. 22, 2017 and his highest-scoring output in Milwaukee ever. — Rookie forward Bonzie Colson got the start in Atlanta on March 31, his first in the NBA, and played 41 minutes, recording 15 points and 16 rebounds. Colson, who had played roughly four minutes combined in his first three games with Milwaukee, then appeared for just 1:27 in the Bucks’ next game at Brooklyn. — Over his last eight games, dating back to March 19, Pat Connaughton is averaging 31.0 minutes, 11.0 points, 7.4 rebounds, 2.8 assists and 1.3 steals while shooting 50.8% from the field (40.0% from 3). — ICYMI: Tim Frazier put himself in some rare Bucks company this past week. — Christian Wood is gone (and flourishing in New Orleans), but the former Buck/Wisconsin Herd was named to the All-G League third team on Wednesday. In 28 games with the Herd, Wood averaged 29.3 points, 14.0 rebounds and 2.1 blocks.